The USI is demanding immediate action by the Government to invest in a publicly-funded higher education and greater grant investment in Budget 2018 and expects to draw over 5,000 students to the demonstration. The demonstration aims to get the Government to rule out any possible introduction of an income contingent loan scheme in the upcoming Budget, to reduce the Student Contribution Charge by a minimum of €250 and invest €1.26 billion into third-level education over the next decade. The union is calling on the Joint Oireachtas Committee on Education and Skills to make a long-term decision to invest in a publicly-funded third level education model, as outlined in the Cassells report – a report published over a year ago – on higher education funding. 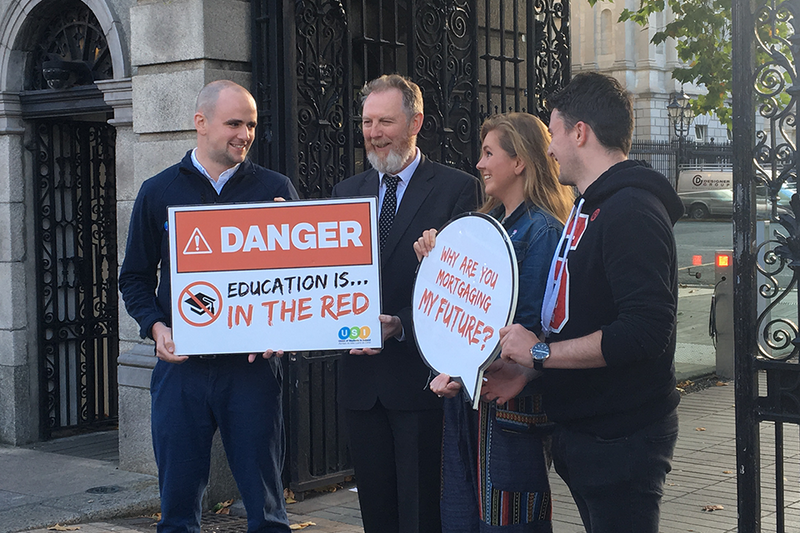 USI President Michael Kerrigan along with other USI members and concerned students wore T-shirts and held signs stating “Education is in the Red”, warning students of the potential threat a loans system would have on their financial future. The USI claims an income-contingent student loan will be unsustainable and will force Ireland’s best and brightest to emigrate. The Union cited an example from New Zealand in which evidence from the housing market showed that 51 per cent of banks that received applications from clients with student debt showed that student loans were the contributing factor in rejecting finance—34 per cent of those rejected finances being mortgages. The demonstration is also being supported by members of the Coalition for Publicly Funded Higher Education including the Irish Second Level Students’ Union, SIPTU, IMPACT, TUI, IFUT and the National Youth Council of Ireland. “We have unions representing college staff, third-level students and now second-level students campaigning on the streets for public investment.. Listen to the people this decision will directly affect. In a country where generations may never get a mortgages or a home, saddling more debt onto children cannot be the answer to increasing access to higher education. This demonstration is the first of many because of inaction from Government to invest in a eroding education system,” said Kerrigan.